Tammy's Spot: Nom! Nom! Nom! 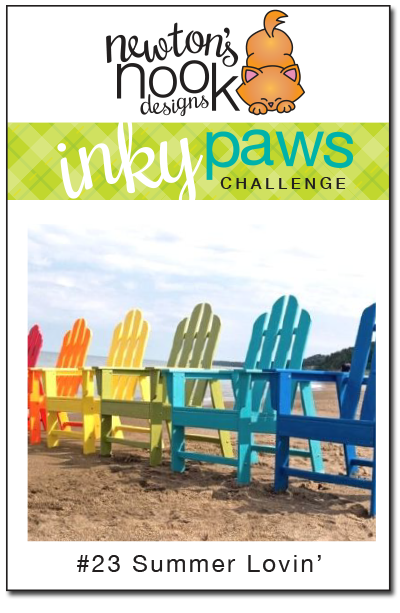 To play along in the Inky Paws Challenge #23 - Summer Lovin', I used stamps from the Shark Bites set from Newton's Nook Designs. I sent the card to a good friend vacationing in North Carolina not too far from where the shark attacks have occurred in recent weeks. I hope it serves as a reminder to stay out of the water! You wouldn't have to remind me to stay out of the water there! You are always so clever, Tammy. Your friend will LOVE this! This is fabulous Tammy, such a great design. I love the way you have created the waves. 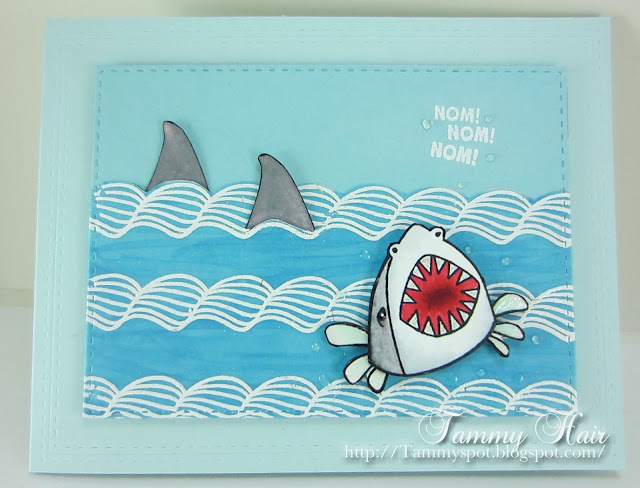 I am not going swimming there Tammy lol he looks very hungry Brilliant card!! Sharks are another of those critters that look better on cards than face to face....like spiders, mice and bats. Great card, Tammy. What a super fun card. Got a giggle out of the sentiment. So cute! Love the waves. LOL...super cute card Tammy..I hope your friend takes your advice..fabulous waves. Lol! Oh Tammy.... only you! I hope your friend heeds the warning & stays out of the water! Eeeek, this is so lifelike - that shark is the bomb! What a fun stamp set - been eyeing it, but have to hold off for now :) Great job on the waves! LOL...I hate to giggle, but that's so true! Don't need to tell me twice. Hysterical and wonderful card!! Great card, Tammy! I'm too scared to wade in past my ankles! Such a funny card! I like the waves. Are they apart of the paper or did you stamp them? Perfect card for shark week! This is super fun! I love the shark jumping out at you with the two fins in the background! Thanks so much for playing along with our inky paws challenge at Newton's Nook Designs! Love this! SO much fun!! Cute card!!! Congrats on your win!! !